Fiona Bruce is at Tewkesbury Abbey in Gloucestershire for the first episode of a new series, which sees one of the most exciting finds in Roadshow history. Browse content similar to Tewkesbury Abbey 1. Check below for episodes and series from the same categories and more! Welcome to a new series of the Antiques Roadshow. and a World Heritage site that's a bit of a secret. Oh, and some very excited visitors, too. Oh, my word. OK, that woke the baby. we've come to this glorious building. Are you thinking it's one of our great cathedrals? though admittedly one of the largest in the country. This church was once a Benedictine monastery, founded in 1087.
some of the richest medieval families became its patrons. They created beautiful chapels where prayers could be said for their loved ones. And this 14th century window, which features some of their ancestors. nothing could save the abbey from Henry VIII. and become head of the Church of England. Tewkesbury Abbey was disbanded that same year. were seized and placed in royal coffers. decided they would not lose their abbey as well. So they rallied together and petitioned the Crown to be able to buy the building. The value was the metal in the bells and the lead on the roof. In the 16th century, that came to ?483. Within two years, the full amount had been raised and the people had saved the church. as the abbey hosts the Antiques Roadshow on the adjacent Pageant Meadow. who are staffing the tea tent and making the whole day run smoothly. Local students are helping out, too. It's a real team effort. Our visitors are already gathering at our rather magnificent new reception. will have that special object. will be in for a big surprise in our new series of the Antiques Roadshow. two lovely ladies. You're related? Yes, we're sisters. We're sisters. Fabulous, who's the elder? I'm the eldest. You're the eldest. You should never ask that, you should never ask that. But I'm the eldest. Do you get on? Yes. Oh good. That's brilliant. Hopefully still will at the end. Hopefully so, although we might have some jealousy. And how did you come to get these bangles? Basically, we inherited it through our great-great-grandparents. I actually got given my bangle on my 21st birthday from my grandparents. So, I inherited my bangle from my grandparents. Lovely. If we start with the pearl and diamond one first. Date-wise, we're looking at the end of the 19th century. 1890s probably more to the level. and then beautiful little half pearls down the shoulders. They're natural half pearls from this period. We're not looking at cultured pearls during this time. and the detailing round and down the side of the bangle. You can just see that. It's absolutely adorable. the attention to detail was extraordinary amongst their pieces of jewellery. which are of course associated with eternal love. All in all, a perfectly romantic bangle. Glorious. Now we turn to this one here, the sapphire and diamond bangle. Again, in many ways, a similar date. From, of course, the fact that we've got this openwork framework to the bangle itself. which is a full circle around the stone, and claw set as well. probably about 20 years earlier. aren't we? Yeah. I think that that is quite potentially what has happened. battle of the bangles or sister envy. But naturally, we're possibly on that line at the moment. It just ticks all the right boxes, doesn't it? At auction, somebody is going to pay in the region of ?1,500 to ?2,000 for it. Nice. Very nice, I'm quite surprised. Wonderful. Sapphire and diamond bangle? It's a big look, isn't it? You know, it's glorious, as I've said, the sapphires are lovely. Perhaps not the finest of quality, but still exceptional. Jealousy of the bangles, now. That is a surprise. But the main thing is, enjoy wearing it. Anne Hathaway's cottage? His wife's house, yes. That's what this chest claims to be, yes. The term which we often hear, what can't speak, can't lie. and when was this label put in? who acquired it from Anne Hathaway's cottage. And do you actually believe it's from the cottage? is because of this date on the lid. and on the baking oven in the house. So who's this? Edward Ounsworth? of the house, but I've not been able to prove that. Now, there's various issues which I find quite fascinating. The calligraphy, is it right? I don't know. You tell me, I don't know. I'm slightly having problems with that. it is a 17th century box, it's beautifully hand-carved in the front. and it's at the sides. But the rest of the box is relatively plain. but then the initials of the cabinet maker or the owner. this is worth many, many, many thousands. and you put this script in front of me. Dog-eared with this sticky tape all up the back, which I absolutely hate. "The Third Man, the draft script." This was the film that Carol Reed made in 1949. Tell me about it. Carol Reed, as he was then. And when we were going through her effects, we found this. I knew, growing up, that she'd been part of the filming process. Yes. And been his secretary. But I never realised she had this in her possession. So she actually went out to Vienna with Carol Reed, and Orson Welles? Joseph Cotton. Joseph Cotton, who was the other man, yes. Who was the star, at the time. Yes, and to film this. Yes. So she must have wonderful memories. because this was originally a novella by Graham Greene, wasn't it? It was, that's right. And she was a temp secretary at the time. was presented with this novella to read, and he said, "I haven't time to read this." "Could you read this and do me a precis?" And that's how the script came about. So she is in fact responsible for The Third Man? You could say that. His most famous film. Absolutely. His film noir, set just after the war in Vienna. beautifully made up and all the rest of it. Beautifully posed with the rest of the crew. She was there for the whole period of filming. to go round and look for locations. They went to the cafes, they investigated the sewers. All the iconic... Images that we know so well. And so she has wonderful stories. I see you've got here also, a letter to "darling", who is? they were courting, I think you would say. They were courting, is the word, yes. He was over in Britain, and she was in Vienna. A lovely long letter. But this great quote, here. "The great Orson Welles has arrived now. "which happened to be in the sewer. "Everybody was ready and had taken ages to line up the shot for him. "Carol was to arrive in two minutes." and stormed out of the sewer and refused to go back. He was very short-tempered and didn't stay long on the sets. How can you put a value on this? I have no idea. I'm going to put a value on it of ?5,000. I think you could talk about three times that. the woman who actually found The Third Man and gave it to Carol Reed. It's got to be worth all of that. to give that horrible itchy atmosphere. but you're both united by one element. And of course, that is the designer. But tell me, whose is whose? Whose is this one? It's mine. And tell me the story - where did this come from in your life? It's been in the family for about 50 years. And that was a gift to my parents by some of their very good friends. And yours? I'm here on behalf of a friend. OK. It was a car boot find 20 years ago, 50p. so he's asked me to come on and hopefully find out a bit more about it. He thinks it's special, but how special? and in 1889, he wins the Grand Prix at the Paris Exhibition. and respected by so many people around him. And this is in a technique that we call intercalaire. carving away, colour coming through the body. And it's so beautifully manufactured and carved. And we've got that fabulous scrolling Galle signature at the side. So a fabulous little piece, a little gem. But then here on this side, you've got something that is just monumental. they did big. And this is just on a scale that is so fabulous. we're looking at a date of around 1900. He passed away in 1904. Around, between 1910 and 1920.
exquisite, great examples of the pieces that were coming from his mind. it does still clearly have his signature down here on the body. So the question is, we have two vases. One is worth more than the other. Who's got the most valuable? Which do you think? You have. Small is best, I think. Small is best. Debatable! the monumental vase, is the most valuable? OK. Who thinks that the little one? OK. You guys have been doing your research. it's after Galle's death, but it's still a stunning thing. This one, small, jewel-like, exquisite, complex. Sadly, it does have a tiny little bit of damage on one of the corners. But take that into consideration. That's not bad for an inheritance! that's some travelling distance from 50p at a car-boot sale! that if a toy is in its original box, that's a real big plus. which is also a really big plus. it's full of a glorious set of cannon-handled knives. Yes, they're beautiful. How did you come by it? mainly spoons to begin with. And I saw this in an auction in Australia, because that's where I live. who was a billionaire, and I knew he'd have very, very interesting items, antiques. So yes, that's why I bought it. So you bought them off a billionaire? Absolutely. Well, actually, he was a pauper at that time. they've gone all the way back to Australia? That's right. And you've brought them all the way back. I have indeed. And they're not light. No, they're not. "if my knives are coming, we'd better go business class!" With knives that good, you'd better go upmarket! Well, I'm hoping to go back first class. OK. So the question is... They'd better be worth a lot! and your extra baggage allowance? We'll give it a go. I hope so. I don't know what your ticket cost. There are 12 knives with the Prince of Wales cipher on. who didn't probably belong to the Prince of Wales. And then there are three with initials on them. same as the box, all been together. Not all of the knives have been in the box all its life, but some of them have. the ostrich feathers of the Prince of Wales. That's right. Which must have been George II as Prince of Wales. because it means somebody can use them. and anyone would love it. They would keep their knives in it. My family were hoping to retire on it! So the porcelain figure is protected by its own glass dome. Has it always been like this, for as long as you've known it? It's always been in a glass dome. I've hardly ever touched the glass dome, or dusting it. It probably frightens you, I guess? I've had it over 35 years, now. given to me all these years ago. I'm going to be very brave and lift this glass off it. Yes, yes. It looks amazing, condition-wise. It is. It's actually really quite an old piece. That was made in, what, 1780s? So back in the 18th century. As long ago as that? Yes. Let's have a look and see. and they are holding different things. This one... He's got a little bird cage and is holding the bird. inside its cage, in some way. They all had different allegorical meanings. And it was made at the Derby factory. When porcelain has no glaze, we call it biscuit. Derby were the great makers of biscuit porcelain. Because without glaze, it gets very grubby, it gets very dirty. Yes. But it shows the modelling so well. It is a hunting horn, isn't it? and his dog down there. and every little leaf is made separately and joined on. But it means it's so fragile. Yes. These leaves drop off at the merest touch. So usually there's a whole catalogue of damage. a fair bit of money, too. I've had it on display all these years. so these birds are your companions there? No, my guests are my companions there, more than these. and we often have discussions about them. And they like to know the history of them. having been inherited from my mother. And have always been with me, as long as I can remember. Just very, very special to me. ornithology that's happening at the period. were beginning to flock to England in the form of illustrations. produced these volumes called A Natural History of Uncommon Birds. which he himself had observed when he was travelling through Europe. other bits of decoration around at the period. and you get them in works on paper like this, which you've got. Now, how much do you know about the technique by which these are done? My mother had a term for it, I can't now remember what it was. Tell me. Let me relieve you, because it's called relievo basso. with copper plates, producing these light relief images. and there were some very distinguished artists, to colour. or in this case gouache. A thick substitute for watercolour which is much better for bright colours. these would all have been undoubtedly exotic. to introduce great colours into a dimly-lit interior. they turn them into deliciously rich-looking objects. ..describing what he's up to. it's a dedication made out to Lady Castlecomer. So, to have the labels on the back of these is just an added extra. perhaps ?3,000 to ?4,000 each, because of the labels. The pair over there in the corner, probably ?5,000. So you're looking at a collection of around about ?20,000. And what a nice thing to have in the guesthouse. Indeed. I mean, just lovely. Thank you very much indeed. Pleasure. because you're a jewellery enthusiast. But you have it in the family, don't you? Yes, I do, yes. This is a family piece from... going back generations. And tell me about the generations. Well, it belonged to my great-grandmother, Katharine Helen Trefusis. And it was given to her by Queen Ena, who's Queen Eugenie. And the wife of Alfonso XIII. Who had a bit of a crush, probably, on my great-grandmother. Queen Ena was very, very good about it. She didn't take it terribly seriously. It was all just light-hearted stuff. to Katherine Trefusis when she married the Honourable Arthur Crichton on June the 13th 1906. Magic stuff. This is exactly the period from which it comes. and it's perfectly natural for her to go to a Spanish jeweller to supply her with a gift. I was going to say, who made it? who were the royal jewellers to the King and Queen of Spain. Made massive tiaras and court jewels for her. And the thing about this is that it's breathtaking quality. I love wearing it. Cos it's not overstated. I can almost wear it with a pair of jeans, as much as a really beautiful dress. The emblematic function of it is wonderful. which are traditionally associated with Venus. And of course it's a four-leaf clover. Gosh, it has amazing symbolism. It does. And so it's luck in love. Which would be perfectly right for a wedding gift. That's just such an amazing meaning behind it, and it really makes sense. pretty exciting stuff, and not many people could lay claim to that. so they've got the ruby round the diamonds and vice versa. Exactly. which you've already brilliantly articulated for us. It's lovely. And with all of that comes the valuation. and I think anybody would be very pleased to give, well, ?20,000 for it. Oh, OK, maybe not an everyday jewel with jeans! Well, you must continue with the jeans, you must! I love it! A pair of heels, jeans, it just tops them off. We've a new challenge for you this series. It's a challenge for me and for you at home. that are stuffed with all sorts of curios and unusual items. delving into their collections to find some mystery objects. The question is, what are they? about the item you brought along today. You have bet me I will not guess what this is. from what you were saying last night. Well, I'm out for revenge. So, shall we go through the clues? OK. So, what could this be? OK. Well, clue A is it's from the ancient game of Tewkesbury Five. and around this area for over 300 years. and it's a cross between squash and handball and fives. and someone came up with the bright idea of making a hand protector. And basically, this would have had a leather cover. At certain points you could catch the ball during the game. and you would have a little sleeve which sat in there, and a finger guard. Basically the forerunner for the baseball glove. You know, as you know it in America. OK. It's local, so that's a possibility. so when you're in the catching point, it goes in the back pocket. it's a 19th-century anaesthetic mask. obviously that was the beginning of anaesthetics. to do the operation. Quite simple. OK. I think that's rather intriguing, actually. Particularly because of the shape of it. What's your final, final offer? Is it an 18th-century light cover for a cargo ship? Now, this actually is more interesting than it sounds. New York was blue, London was, like, white. which showed which sort of ship was coming in - cargo, naval, passenger. The beauty... Oh, not going to say too much. Oh. Did we get a clue there, ladies and gentlemen? I wonder. So, help me out, folks. Any takers for the Tewkesbury fives? Yes. ..in the professional way. wouldn't it, if you think about it. And then the light. The ship's light. Show of hands. Ship's light. It doesn't look to me like any of those things. I'm going to guess the anaesthetic gas mask. Come on. Shall I put you out of your misery? Dr Foster, is that an anaesthetic gas mask? Oh! OK, you definitely owe me a beer. Ah! So tell us more about it, then. of the George Marshall Medical Museum and they're quite simple. Great thing to see, and I look forward to that beer later, John. This is a utility knife multitool. This one has been around for quite a few years. I wondered if you knew exactly what it was. I've done a bit of research and it's described as an SOE escape life. operatives to go and set Europe ablaze, and they did that. They were known as the Department of Ungentlemanly Warfare. for raiding, for disruption, for lowering enemy morale. You obviously know a bit about this fantastic knife. refurbish them and send them to the very poorest in Africa. upside down in the skip... Fantastic. ..pulled it out up the bottom. it was something a little bit different. which was designed in 1900, for the Boer War, I guess. We can see the function of the wire cutters on it. They're really quite strong. You'd get through some quite heavy gauge wire with that. It has a blade on it, and you said it was covered in gloop. There's still a bit on there. But I think perhaps the most important part of it is that. somebody else said it was called a lock breaker. and the person who said it was a lock breaker, well, it would do. you're walking past Colonel Von Schultz's lovely Mercedes and you go, "Pssst! "Ah, We have a puncture, Herr Colonel. "Oh, my God. I have to be in Berlin tomorrow." you've tied his mechanics down, you've tied him down. Have you had a think about what this might be worth? No. I've had some wildly inaccurate estimates. I've got no idea, really. As it stands, they are a rare thing. and probably on a really good day, 1,000. That's great. I think it's fantastic. It's just really so nice. I'm very enthusiastic about it. Thank you for that. Thank you for bringing it. A pleasure. And keep skip-diving. Oh, yes. which we are looking at here in this beautiful photograph. in aid of the Abbey. In aid of the Abbey bells in 1962. When this photograph was taken, there weren't any bells there. They were all off at Loughborough being recast. In aid of the bells. There he is. The great founder of this whole affair. It's wonderful, isn't it, really. He was of course the sales clerk of the auctioneers, wasn't he? Raised the money, got the people to give the antiques and works of art to the sale. and I think the bells cost around ?7,000. He was a great, great man. We'll never forget him, I'm sure, on the Antiques Roadshow. These pieces are yours, are they? blue murder and the vicar would pick that up and it would go "cuckoo" and I would stop screaming. So it actually goes "cuckoo"? It actually goes "cuckoo". Oh, let's have a demonstration. Let's see if we can have a go. We can have a demonstration. It must be June. He's coming back soon. Perfect. Yes, wonderful. Welcome back, cuckoo. They are, of course, both of them and the chest of drawers, it's slipware. Slipware is a very traditional English method of decorating of the clay. to make the decoration, and then you fire it. most likely in Halifax, something like that. They are very collectable nowadays. I suppose the cuckoo is a pair. Going to be worth ?1,000 or 1,200 as two. Right. But they're beautiful things. They're lovely things. Lovely, wonderful things. Here we are outside Tewkesbury Abbey. On a beautiful summer's day. that it floods, and floods quite deeply. pine seaman's chest. Yes. It belonged to my great-grandfather. he died in 1918 and this was his chest through his entire merchant career. for a while and then more recently had camping equipment stored in it. I thought great-grandad would have liked that. And then most recently we just use it for keeping photographs in. I like these sea chests because they are very plain and ordinary-looking. They are made by probably the ship's carpenter for everybody who came on board ship. pinch your kit, but it was not a beautiful work of art. So what's happening inside here? and maybe your clothes were soaking wet, you could keep them away from the dry ones. really to keep your personal possessions. It had everything you wanted. when you told me it was decorated on the inside I thought, "Oh, yes. "Another seaman's chest that's has been later decorated." But this is absolutely period. Yeah. Now, he started what? merchant seamen stuff and going overseas. I mean, it says "It shines for all." and then the white ensigns and the jacks over there. And this must be around the time of the Civil War in the 1860s, that sort of period. it sort of implies he had a strong connection with America. And what sort of ships did he captain? For the greater part of his high career, he was on fast clippers, as far as I'm aware. So it's not impossible to believe he was trading across the Atlantic. I'm sure he was. That's where the big money could be made. and they were the racing cars of their day. They raced across the Channel. The first one there got a bonus. So it's a lovely memory to have of him, though. Yes, it is and it's lovely to have this connection with that sort of immediate past. Now, this is something I term as British folk art. And it's not highly regarded here in the UK. In America, they treat it with great reverence. What we have here is a book printed in Launceston in 1848. But this is not Launceston, Cornwall, is it? What's the Tasmanian connection here? renew his driving licence or something mundane. They were throwing a load of books out and Dad saw this and just asked them, could he take it. And they said, "Yeah, just help yourself." Really? So he just retrieved it from the rubbish bin. Well, er, and how came he to Tasmania? and taken to Botany Bay. Really? Yeah. And that was in 18...? 1788. 1788. Yeah. which was what they called Tasmania at that point. And a very early printed book, really, for Tasmania. and what would happen if you did. to one of the King's ships or stores. you got the death penalty. And the same happened with aiders and abettors. or some other disorderly house? I think it was a harsh world for these people. Excellent. I'm not going to sell it, though. but it's got a connection to the family history so, yeah. Very good. Thank you for bringing it. Thank you very much. Thank you. Fergus, word is going round the Roadshow that you've found something seriously exciting. Something quite, quite, quite extraordinary. The dream item for me. I couldn't imagine anything better. Look at those. Now, those are seriously early and important. By which you mean how early? Well, they're 1730s, 1720. I don't know. I need to see them more carefully. But they are extraordinarily rare and significant. "I've got the whole house at home with all the furniture and more dolls." The doll's house? The doll's house that they come from. ..it's of national importance, seriously. National importance and potentially extraordinarily valuable. So are you going to go and see it? Well, the day's running on, so I'm going to jump in a car. and we're going to go and see what we can do about it. Make sure you report back. Don't worry. It's really, you know, my fingers are tingling. but it's got a very nice story attached to it. Perhaps you'd like to tell us about it. and my brother, we used to play in the road. No traffic on the road then, of course. at the market gardens on the other side of the village. the prisoners of war made toys for the children. I managed to catch this boat and took it home. It went in my toy box and, as you see, it's been well played with for the years. my mum said to me, "I'm having a tidy up. but there was a letter that came with it. Really? So this is the letter here. Fantastic. Are you going to read it out to us? OK.
"Dear boys and girls, we are very pleased to see you all every day. "Many thanks for your kindness. "but all of you are our best friends. "morning and in the evening to wait for the POW. "We can't see our children but we are very glad to see all of you. I mean, that really makes the boat. I've got to put a value on it. I really can't. I didn't really expect it, to be honest. at auction perhaps ?30 or ?40. But you are never going to sell something like that. I mean, it's fantastic. That's right. It's really nice. And thank you so much for bringing it in. I think that's really great. because I have a great affinity for this particular type of object. I need to know how you acquired it. I need to find it little bit of history behind it. Tell me where you got it from. My parents had it before I was born. I was brought up with it. So I don't know where they got it from. I inherited it eventually and we would keep bananas in it. That's what the idea was. It's the perfect shape for bananas, isn't it? But, yeah. To be frank, actually, it was never made for bananas, quite obviously. it's what's known as a grease bowl. And it comes from an indigenous group of people called the Haida. And it is just so remarkably stylish. and have you ever kind of wondered what the creature is? I believe, is it a seal? It is a seal. Yes. I mean, they are just known as seal bowls, basically. coming off to a pair of flippers at the back there. And, actually, what this really denotes is a new-born seal, a pup. It's done in such a beautifully stylish way. Now, I think this is probably cedar. I was going to wonder what wood it was. I think it's cedar. This one, though, I think is probably early 20th century. I still believe it's such a gorgeous object that it's worth 3,000 to ?5,000. My word. That's more than I was expecting. ?3,000 to ?5,000? It's a stunning, stunning thing. I don't think you'll ever know its true price unless it's sold. Well, thanks very much. That's very interesting. I didn't expect it to be that much. My favourite item today. Thank you. Well, thank you, Marc. Thank you. This is what I call a gem of a picture. It's got everything I like. and I see down here it's got "With kind regards, Frank Dicksee." Yes. And that's Sir Frank Dicksee. And this is a study for a famous picture. Do you know the painting? Yes, it's called The Two Crowns. And I know the painting is a big oil. It is. Now, how come you have this? Because she is my grandmother. And she was a good friend of Sir Frank Dicksee. He made a proposal of marriage and she turned him down. Well, I can see why he wanted to propose to her. What a beautiful woman or beautiful lady. Frank Dicksee was a major late Victorian painter. He is on the fringes of the Pre-Raphaelites with Poynter. And some of his early drawings are very Pre-Raphaelite-looking. And this is a sort of in between period, but I just love it. I love the way her arm is draped over the side and she's looking out. We have to put a price on it. I know this is very dear to you and I'm sure you're not going to sell it. My word. I thought it would be worth ?100. ?100,000? Well, the family will be very happy with that. a little cardboard box with three dolls in it. when you mentioned those dolls actually lived in a house. "we're talking something quite, quite incredible." And can you tell me what you know about it? So all I know is that it's from the beginning of the 18th century, 1705, apparently. which I think means Emily but it might have been something else. Then it becomes a bit of a problem because there is no female line. I am one of three boys. Right. So let's get this into context. not doll's houses, until the early part of the 19th century. There is no other like it. It is totally unique. from which they came was in your house. has been preserved in your family for all these years. That is why it's so moving. to try and convey to people quite how important these things are. I must admit, that when I saw it I recognised it. on it so it was something I laid in bed at night dreaming that one day I would see it. And here I am! The Westbrook Baby House. And here you are. And these pieces really confirm its importance. This is a thing I noticed when I first saw a picture of the house. paper scraps and it's painted. And I guess it was probably trying to simulate a piece of stump work. I can't resist doing this. Press the little button. The brightness of that colour. I'm ashamed to say, I've never opened it. You've never opened it. Look at that. and I think some of the contents perhaps came from the next generation. Was added and I think it was added up until the end of that century. Yes. Post-that I don't think it's been touched. No, absolutely. I mean, these dolls, they've got those fork hands and very distinctive faces. than 1705, so they could be another generation adding to it. And the hair, what would that be made of? The hair, I think the hair's mohair. "That can't be real and genuine." But it is! It's the importance of this object. I have a passion for early doll's houses. something and people say, "That's great. Isn't that beautiful?" And then you can shut the door and then it's gone so it's lovely to see it in the light of day. Yeah. And it's the Antiques Roadshow and we have to come up with a value. Do you have to? Yeah. I'm told I must. Let's leave it at that. Well, no. I've done the work and I'm going to give you one. But that doesn't matter. That doesn't matter, no. Well, it does a bit. But, you know, this is an object of national importance, really. programme of the new series as well. I think Fergus thought all his Christmases had come at once. From all of us here at Tewkesbury Abbey, bye-bye. BBC Two takes a sneaky peek behind the celebrity curtain. Go out there, grab it with both hands and stick it in your mouth. 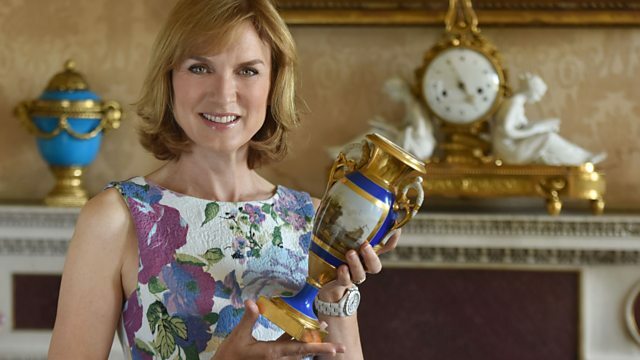 Fiona Bruce and the team are at Tewkesbury Abbey in Gloucestershire for the first episode of a brand new series, and over 2,000 visitors dig out their treasures in anticipation. Two sisters gifted with their great-great-grandmother's jewellery are drawn into the 'battle of the bangles' to find out who has the finest inheritance. A plain box catches the eye of our furniture expert Lennox Cato when the owner makes a claim for it to have once been in Anne Hathaway's cottage. An Australian visitor finds out if the set of silver knives she brought over was worth the cost of the ticket. And one of the most exciting finds in Roadshow history emerges when a collection of rare figures and dolls' house furnishings from 1705 stuns expert Fergus Gambon, who excitedly tells Fiona it is of national importance... and not insignificant value. Plus the first in a new audience guessing game with the Enigma, in which experts challenge us to guess the purpose of a mystery object.